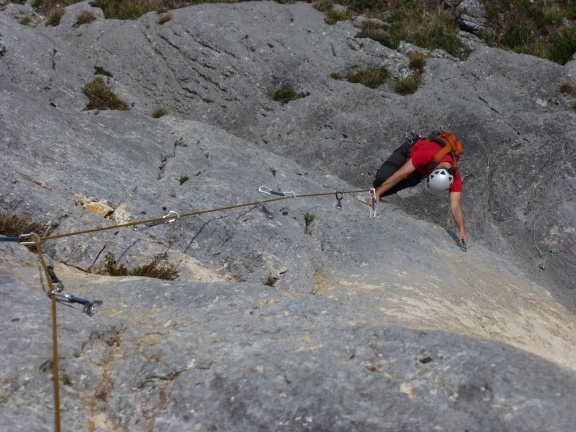 One of the pleasures of visiting Vienna is the chance to go alpine sport climbing with minimal access. 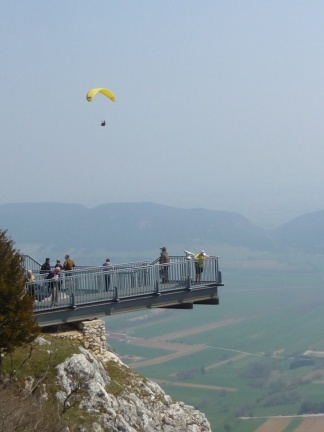 The Hohe Wand can be reached in about 40min from Vienna, and offers a variety of recreational activities, including my favorite – climbing. 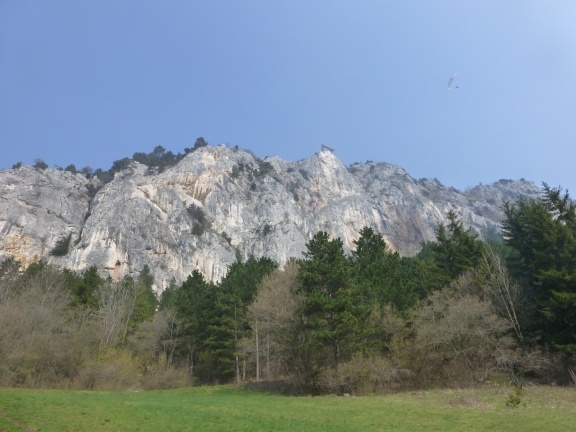 This time we decided to attack a route I haven’t climbed before, calls “Sag niemals nie” (Never say never again). More detailed information including a topo can be found here. After the incredibly long approach of 10 minutes (sic! my Japanese friends do you hear!) we are starting next to the HTL Klettersteig, an incredibly popular via ferrata (apparently the Italian name is used in English, too). The first two pitches are more on the easy side, but exposed to stones from the via ferrata, so we hurry up to the third pitch, the first one that gives a beautiful impression (UIAA 6-). The following pitch is the crux (UIAA 8- in one place, the rest consistently between UIAA 7 and 7+). And it is my part to lead it. 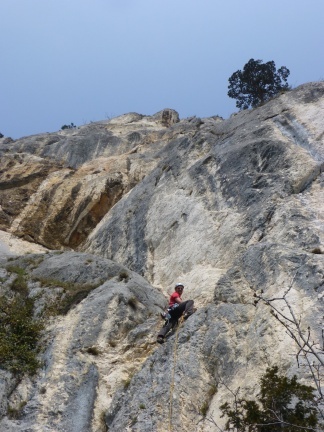 Florian was so nice to take the small backbag, which is a bit a pain in this long and challenging pitch. After climbing another pitch in the 7. UIAA grade we follow the via ferrata in the upper part until we reach the “Sky Walk” on top of the Postlwand, a protruding platform with spectacular views. More photos can be found via google. 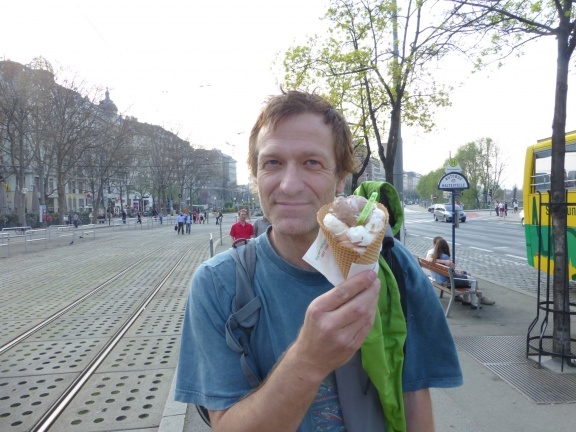 After climbing another short and easy route we returned to Vienna, and enjoyed a nice big ice cream to cool down. This huge ice cream for 4.10 Euro (about 530 Yen) was filled with six different types, including my favorite Nocciolone, from one of the best ice cream parlors in Vienna and the world, the one on Schwedenplatz. 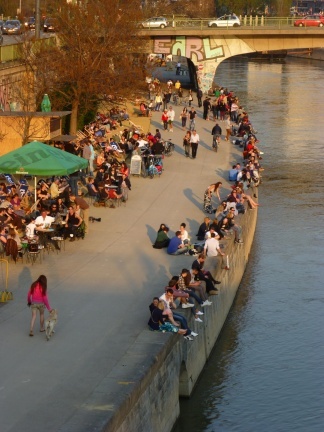 The rest of the late afternoon I spend with a glass of wine along the Danube channel, bathing in the sun, reading, watching people, and enjoying the much slower Vienna life then the stressy Japanese life.